A beautiful property with multiple investment potentials. Price reduced from $1,200,000 until April. Largely planted as a Teak farm, the rolling hills with beautiful ocean and mountain views create a perfect setting for developing home sites as the trees are harvested. This finca could host a variety of investment opportunities making it an excellent buy in today’s market. Finca Granada was planted in 1996 with 80 hectares of Teak and in 2008 with 10 hectares of Acacia. 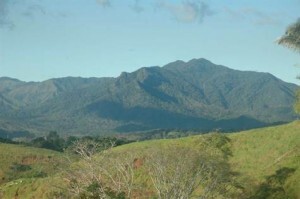 The remaining 20 hectares are naturally forested areas. The Teak is in good condition and sufficiently mature for an early harvest or to keep as a long term investment. The Acacia is growing extremely well even though it is younger. The greater value of this farm, however, is not in the wood but rather the land itself. The property consists of rolling hills slanting down toward the Pacific Ocean providing great views with year round sunsets over the Pacific. It has a deliciously remote and peaceful feel, but is only two hours from the International Airport in San Jose, and 25 minutes off the Coastal Highway between Jacó and Quepos. This property is unusual as it offers two ways to maximize cash flow with the flexibility to allow a buyer to commercially harvest all or some of the trees to coordinate with development staging or replanting. The highest ridge view lots may be easily developed today allowing the full maturation of the teak over the balance of the property as one of many options to consider. The teak will reach full maturity/value in ten years according to a recent evaluation. The farm has electric and cell phone service. With the cell service, you can now get a 3g modem that yields 2mb/s internet connection. The famous beach at Palo Seco is less than a half hour drive.